(186 x 259 mm) 8.3 x 11.7 in. (186 x 259 mm) 11 x 14 in. This magnificent oil painting by Devendra Man Sinkhwal is based upon an original oil composition that was painted by Udaya Charan Shrestha. Mahalakshmi, or 'Great Lakshmi', appears as one of the astamatrikas, or 'Eight Mothers', who are extremely important in the Newar tradition and function as the guardians of the eight directions and the consorts of the astabhairavas, or 'Eight Bhairavas'. These eight Bhairavas are the wrathful manifestations of Shiva, each having his own specific colour, attributes, direction and vehicle, and likewise the eight great Mother-Goddesses or astamatrika each have their own specific colour, attributes, direction and vehicle. Carved images of the astabhairavas and the astamatrikas are commonly found upon the diagonal wooden struts that support the roofs of many Newar temples, with two directional pairs of these male and female tantric deities appearing on each of the temple's four sides. Mahalakshmi is the female counterpart of Samhara Bhairava, and they are both commonly assigned to the northeast corner. She is golden-yellow in colour and her vehicle is a lion. 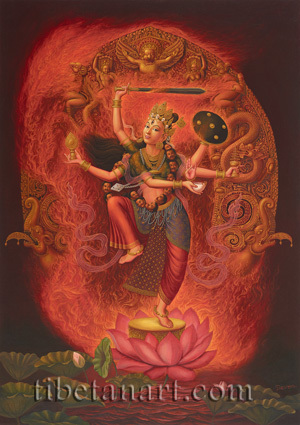 Here Mahalakshmi appears in dancing bow-and-arrow posture, with her right foot raised and her left foot pressing upon the seed-head of a red lotus that arises from a lake. She is beautiful, youthful and lusty, with six arms, three piercing lotus-like eyes, and she makes a slightly haughty and wrathful expression as she reveals her upper teeth. She wears the red silk garments and jeweled ornaments of a kumari, with her golden Newar tayo and chained silver medallion hanging around her neck. Her golden crown is adorned with five small white skulls, her black hair billows freely behind her back, and she wears a garland of the freshly severed heads of asura-demons. With her first pair of hands she makes the bindu-kapala-mudra, with her right hand holding a skull-cup full of blood, and her left hand above with her third finger and thumb touching. With her second pair of right and left hands she holds her traditional Newar attributes of a golden mirror (darpana), and a golden container for vermilion powder (sinhamu) with six parasol-wheels adorning is top. With her third pair of right and left hand she wields aloft an iron sword and a shield, which symbolizes her abilities to destroy all enemies and to protect her devotees. Mahalakshmi's radiant form emanates a blazing and swirling mass of wisdom fire, behind which appears the arch of her golden torana, which is embellished with the traditional Newar images of two ferocious makara or 'crocodiles' with long scrolling tails; two jewel-grasping dragons with rearing griffins or garuda-lions standing upon their backs; a pair of male and female naga-serpents, and the crowning image of Garuda at the top of the torana.